Dr Roberta Babb watches the film 13th. 13th is a raw and powerful new documentary directed by Ava DuVernay, a Golden Globe and Oscar nominee for Selma. The Netflix feature-length documentary opens with shocking statistics, grippingly spoken by outgoing President Obama, that ‘America is home to 5 per cent of the world’s population, but 25 per cent of the world’s prisoners’. In the land of the free, what is even more concerning is that one in three African-American men will be imprisoned in their lifetime. 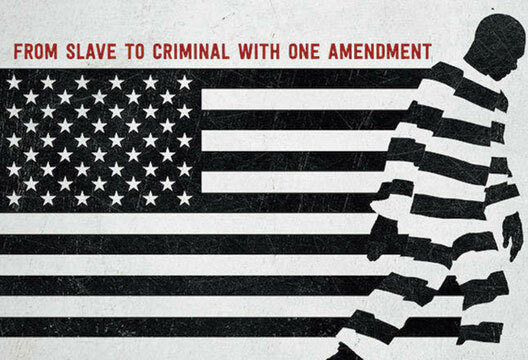 Against the backdrop of the current political climate in the USA (which includes movements such as Black Lives Matter), 13th offers an unflinching look at racial inequality within the criminal justice system, the American politics, the concept of ‘black criminality’ and the USA correctional service. The documentary takes its title from the 13th Amendment, which made it unconstitutional for any American to be held as a slave. A clause exempts criminals from this Bill of Rights. The film argues that this loophole, which allowed servitude as a punishment for crime, has been exploited and actually serves to maintain African-Americans in servitude within the context of the criminal justice system. 13th takes a significant step forward in identifying and naming the mechanisms by which black people are incarcerated at a higher rate than their white counterparts (1 in 17): legislation, lower socio-economic status, illegal drugs, relationships with law enforcement and politics all play a part, along with more psychological and psychodynamic mechanisms such as fear of the Other, splitting, projective identification and internalisation. 13th confronts issues of racial inequality within the USA by embedding them in a historical framework. The first half sets the scene and provides a stark review of the context of the country’s relationship with slavery, racism, politics, legislation and criminality. The second half focuses on the US correctional system, racial biases in the criminal justice system, black mental health, and issues associated with mandatory sentencing and plea bargaining. It also explores the financial implications associated with the interlinked web of companies that profit and contribute to growing prison populations. One example is Kalief Browder who was imprisoned without a trial for three years on false charges of robbery (stealing a backpack) at 16. He was unable to post bail set at $10,000. He maintained his innocence by refusing a plea bargain which resulted in his incarceration. Two years following dismissal of the case and his release, Kalief committed suicide by hanging himself. Activists attributed his mental health decline to the beatings he received by other prisoners and guards as well being held in solitary confinement for two of the three years in prison. 13th presents the vicious cycle of the psychological impact narratives of racial difference (i.e. presumption of dangerousness and guilt) continue to have upon African-Americans. This includes their sense of self, their family structure (loss of sons and brothers, and absent fathers), the intergenerational transmission of negative racial experience, their sense of community and their uncertainty about their place in the 21st century (e.g. the loss of the right to vote). The documentary invites a diverse range of highly respected individuals to comment, and the narratives are arrestingly illustrated through archive video footage and interviews with those directly affected by this phenomenon. The film is set to a powerful soundtrack from lyrical wordsmiths who further connect the viewer to the raw emotions evoked through the narratives and visual images. 13th provokes strong feelings of upset, anger and shame. However, it also leaves the viewer with a sense of hope. The film, along with modern-day advances (such as instant video recording and the internet), and increased awareness and courage, may allow conversations to occur that effect meaningful change and address the longstanding/chronic issue of the disenfranchisement of an entire race based upon skin colour. Although the documentary is American, it has implications for the UK. It invites us to think meaningfully and critically about the UK’s experience of race, racism, the criminal justice system and the prison service.